The kitchen is one of the most important rooms in the house in regards to lighting. It is home to many activities that need task and general lighting. Your plan should include enough light to see into cabinets and pantries, adequate task lighting over sinks, countertops and islands and ample lighting over a table for dining and family activities. The possibilities are endless and can include chandeliers, wall sconces, under-cabinet lights, recessed or track lights, ceiling fans and pendants. Soffits, ceilings or toe kick areas of the cabinets or island can be lit for design style or as a soft light at night. Because there are a variety of activities that take place in a kitchen, dimmers are a nice addition to your lighting plan. TIP: The darker the surfaces of the countertops, walls and floors, the more wattage you need. Always plan for more light than you think you need and use dimmers or extra switches. If I hang pendants above a kitchen island, how high should they be? Pendants or fixtures that hang above the island or bar should be high enough so that all members of the household can look across the island or bar without their vision obstructed by the fixtures. The exact height depends on your personal preference. 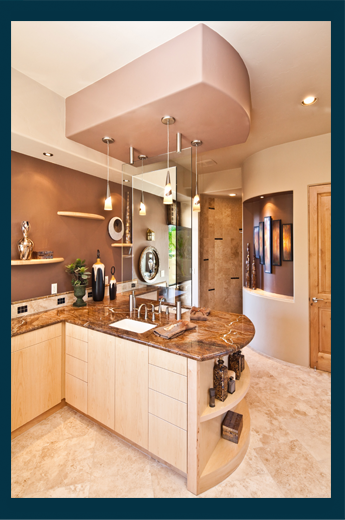 We recommend being home when the pendants are installed to ensure the perfect install.